Ramsay’s original discharge tubes. These glass tubes may not look like much but these are the pieces of equipment he used to first collect the five new elements. Ramsay was an accomplished glass blower and blew all of these himself. How many people can say they made their own lab equipment now-a-days? My favourite thing about these tubes is that they still glow when an electric current is passed through them…we will be demonstrating this on the day! The sample of Cleveite that Ramsay used to isolate Helium, and his lab books from the time that record his thoughts and discoveries. The other four gases can be extracted from the air itself, but Helium can only be found in mineral deposits as it is so light that when released it leaves the Earths atmosphere and floats off into space. 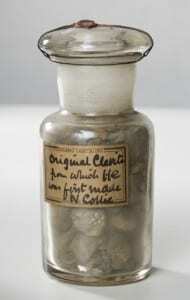 Cleveite is slightly radioactive, and because he was working with radioactive materials at the time so are some of Ramsay’s notebooks. The lab books have kindly been lent to us by UCL Special Collections. 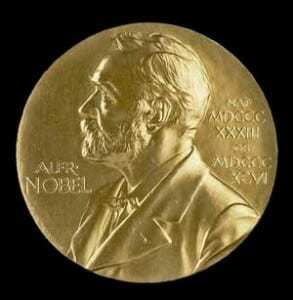 the Nobel Prize. 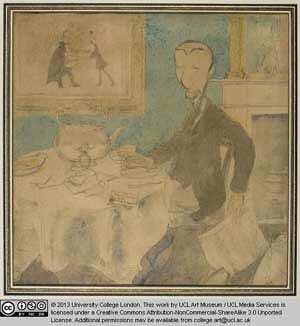 UCL Art Museum. A cartoon of Ramsay receiving news of his being awarded the Nobel Prize, drawn by Henry Tonks. I love this picture as it shows Ramsay, to my eyes grinning (understandably), with the telegram informing him he has won on the table. It appears that he has received news over breakfast, as there are eggs, bacon and an oversize teapot on the table. This will be on loan from UCL Art Museum. 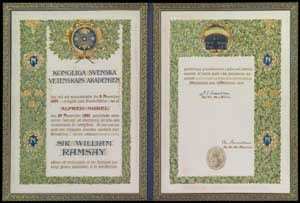 Finally, and by no means least, we will be displaying Ramsay’s Nobel Prize citation and medal. This is the first, and probably last, Nobel Prize I have ever seen in ‘real life’, and it still gives me a thrill every time I see it. I am not saying the readers of this blog won’t ever win a Nobel Prize, but on the off chance you don’t this might be your best chance to see one up close and personal. Well worth a visit if none of the rest of this catches your eye. 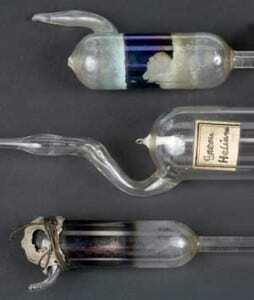 The event will be hosted by Emeritus Professor Alwyn Davies FRS, from the Chemistry Department, who will be on hand to discuss Ramsay’s life and works, and to light up the tubes containing the noble gases. The pop-up will run from 12.30 – 3pm on Friday 1st November. Entrance is free and open to all.